If you’re not a fan of coffee, you might want to move on, this recipe probably isn’t for you. However, if you’re a coffee-lover like me, you’ve come to the right place! 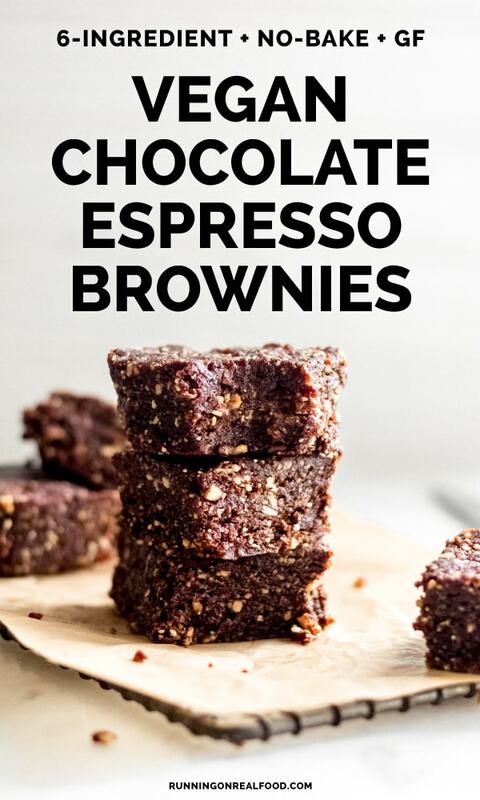 These no-bake chocolate espresso brownies will be right up your alley. These brownies are vegan, gluten-free, have no added sugar and are made with wholesome ingredients. My only tip for making these bars would be to not sample them in the evening, or you might lay tossing and turning when bedtime comes. Ahem…that totally didn’t happen to me. These have a very strong espresso flavour, they almost taste like chocolate-covered espresso beans. 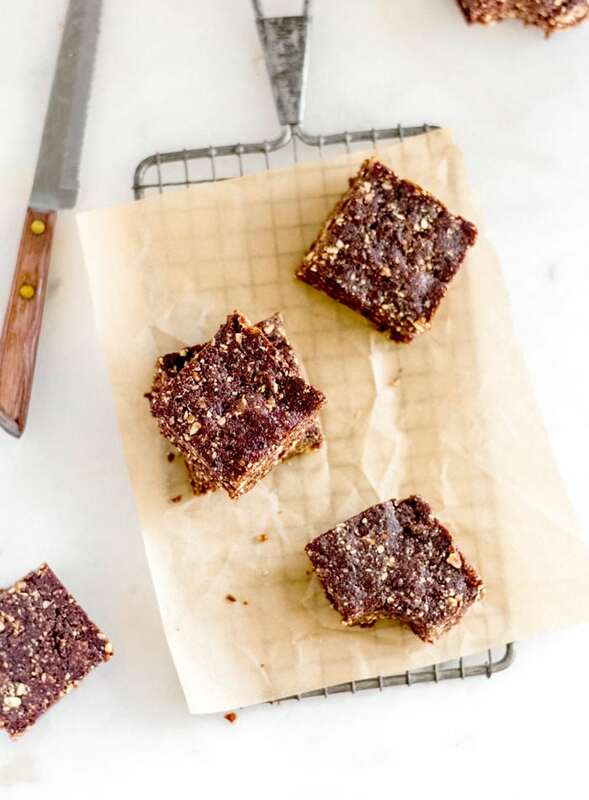 If you prefer a sweeter bar, you could reduce the espresso to 1 tbsp and add 1 tbsp of maple syrup. You might want to enjoy these bars before lunchtime to prevent any disruption of sleep. 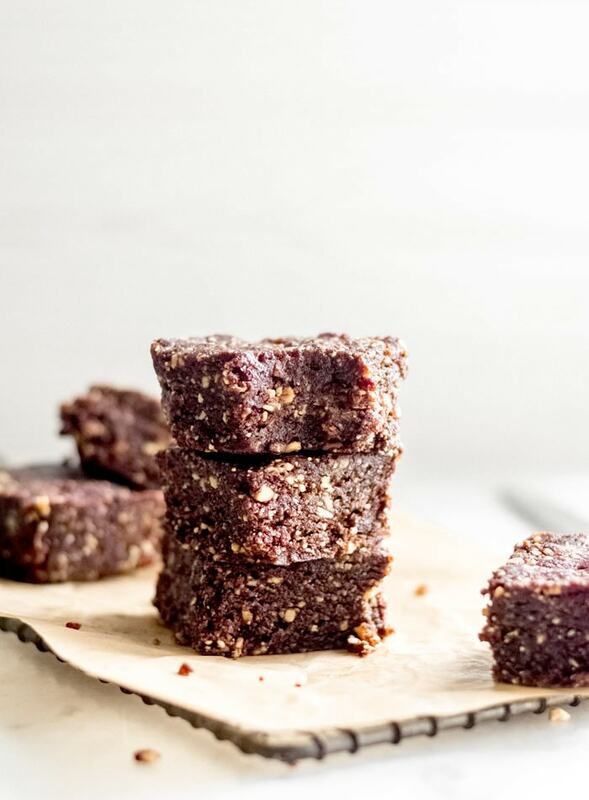 Luckily, you can completely get away with eating them for breakfast because they’re made with simple, whole food ingredients. These would also make a fantastic pre-workout snack. You’ll get a little energy boost from the caffeine and energizing, clean carbohydrates from the dates. Plus the almonds and almond butter provide some protein and essential fatty acids. If you want to use them as a pre-workout energy snack, I would recommend rolling the dough into balls for a quick snack you can just pop and go! Guess what? You only need 5 basic ingredients to make these, plus vanilla and sea salt which are optional but recommended to enhance the flavour. If you don’t have an espresso maker, you can use strongly brewed coffee in it’s place. I actually stopped off at Starbucks one day and ordered two shots of espresso just to make these, so there’s always that option! 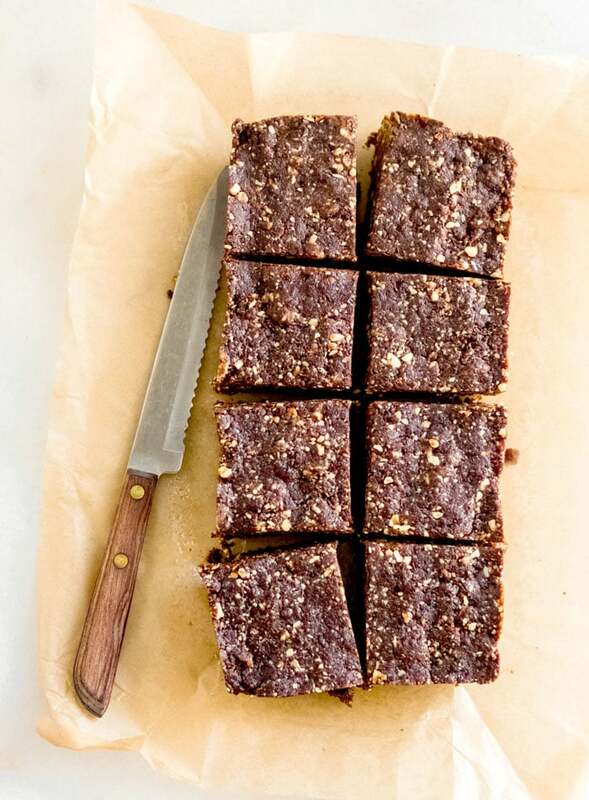 You will be amazed at how rich, decadent and fudge-like these no-bake brownies are. The chocolate, almond and espresso are amazing together and pure vanilla and sea salt really bring out those flavours. 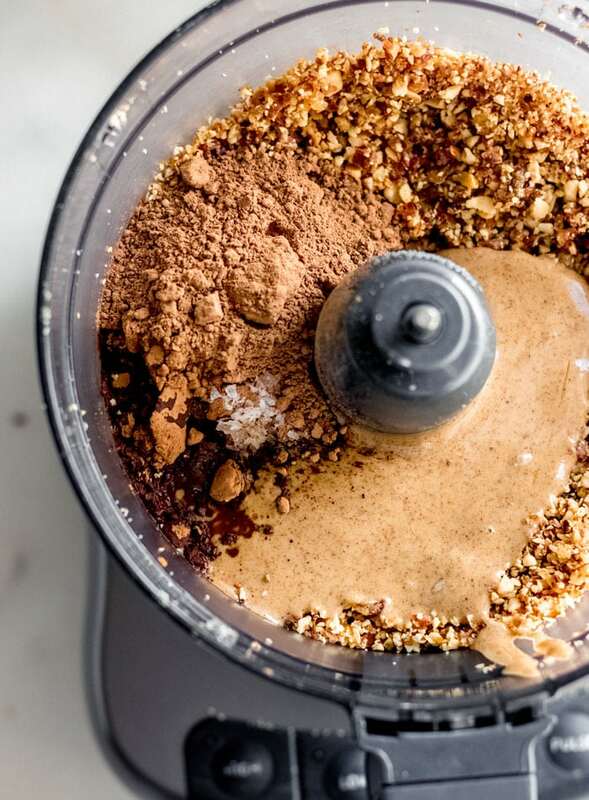 If you use raw cacao powder, they’ll be chock-full of antioxidants and the dates, almonds and almond butter all add their own host of health benefits. 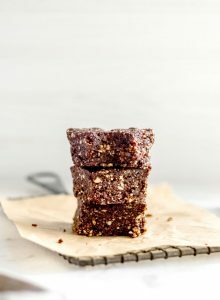 These rich and fudge chocolate brownies are soft but firm, decadent but healthy and everything you want in a dark chocolate, espresso-inspired no-bake vegan brownie. 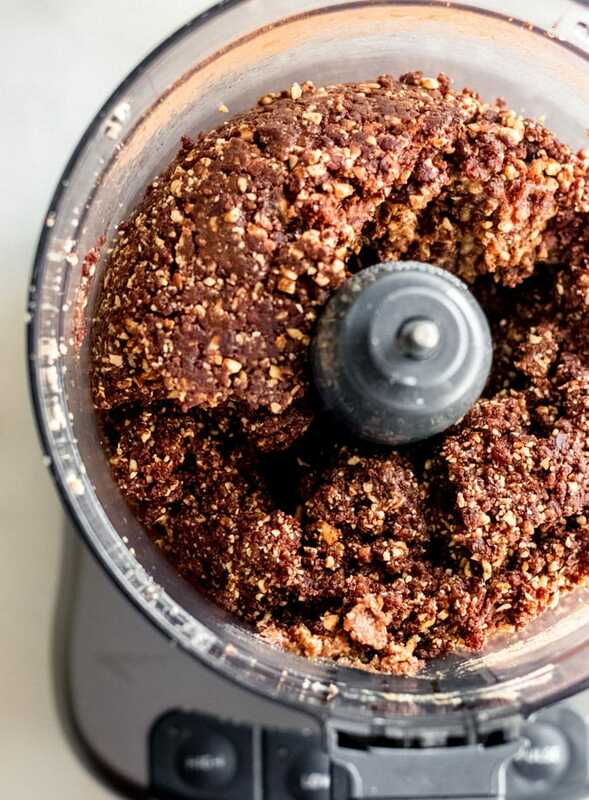 Place almonds in a food processor or high-powered blender and mix until broken down into a grainy flour. Add dates and continue to process (if your dates aren’t soft and fresh, soak them in hot water for 15 minutes then drain before using). Add almond butter, cocoa, espresso, vanilla and sea salt and process until it forms a thick dough. 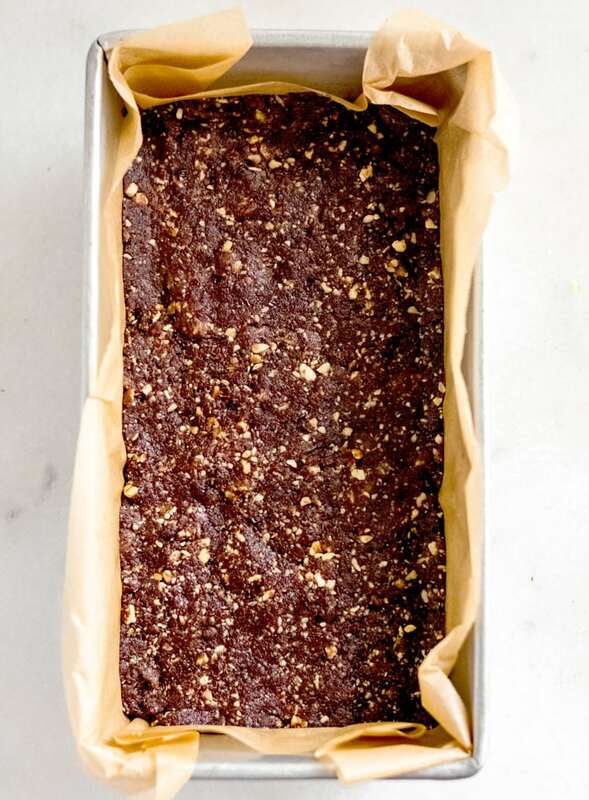 Press dough into a lined loaf pan for thick bars, a square baking pan for a thinner bar, or roll the dough into balls for brownie bites. Place in the freezer for at least 3 hours to set. Lift out of the pan and and cut into 8 bars. Store in a sealed container in the fridge for up to 2 weeks or freezer for up to 3 months. Um hello delicious! Wow Deryn, these look amazing! chocolate, expresso, almond..I’m hungry now! I made these last week and they’re delicious! I still have half of them left though. How long do they last for in the fridge? Hmm, I’m not too sure, they didn’t last very long at my house. I’d think they’d be okay for 3-4 days in a container though 🙂 Glad you enjoyed them! I wouldn’t recommend replacing the dates in this recipe as they’re the base that holds it all together. You could maybe try soaked and drained raisins but I don’t know how that flavor would go with coffee. These do not have a strong date flavor with the added cocoa and coffee though, so it might just be okay for you with dates! Could I use almond flour? If so, how much? Thank you! 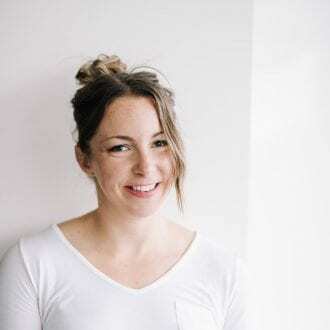 Hi Heather, I’m not sure how the recipe will come out with almond flour as I’ve never tried but. I think you could make it work but it may change the texture quite a bit since almond flour is so fine. I can’t say the exact amount but maybe start with 1 cup , add the rest of the ingredients and adjust as needed. It should be a thick, doughy consistency before you press it into the pan. Again, I haven’t tried it so I can’t guarantee results. Thanks!